There have been a lot of changes around here, lately. First, there’s the fact that winter immediately skipped over spring and handed the baton over to summer (Hello, 90-degree heat wave! My perspiring armpits salute you.) Then, there’s the fact that I recently turned 24 and don’t feel a day over 40. There’s also the fact that Elliott just finished his last test of the first half of grad school, wiping off a good deal of blood (literally), sweat and tears (or, in his more masculine case, a good deal of frustrated teeth-clenching) away from a well-worn year. There’s also the fact that I’ve decided, on this here Girl Versus Dough blog, to change things up a bit. You see, since its inception, GVD has been a haven for bread recipes attempted (read: Attacked) by me, so that I might do the grunt work for you and present you with the final result: Much more manageable (and less stressful) bread recipes. But though you might guess all we eat around here is bread, all day, every day, that’s not the case. My freezer, busting at the seams with half-eaten, foil-wrapped loaves from oh, two months? Eight months? ago can attest to that. No, indeed, we do eat more than bread. So, with that said, while I most definitely will keep baking away and writing about my adventures in bread baking, I will also share some of the other, non-bread stuff we eat from time to time. Because I think, sometimes, we need to mix it up a bit. Nothing too crazy — just let our hair down and paint our nails neon colors and wear high heels for once — or something. Just something a little less… redundant. 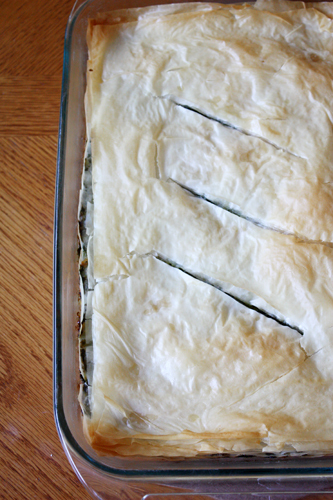 Enough of my babbling — I don’t know what inspired me to make spanakopita the other day, suffice it to say that the word itself is fun to say. I regret to inform you that I cheated — I bought pre-made phyllo dough instead of making it myself. I know. I know. But a girl’s got to do what a girl’s got to do, and if that means taking one for the team so I can get this spanakopita on the dinner table before midnight, then so be it. For those more adventurous than me, here’s the homemade phyllo dough recipe I thought about making (that counts for something, right?). As for the filling — the chopped spinach mixed with sharp scallions, olive oil and tangy feta cheese in a pillowcase of buttered thin dough — that I took care of from start to finish. Every. Last. Bite. Preheat oven to 350 degrees F. Heat 2 tbsp olive oil in a large pan over medium heat. Add spinach and toss until just wilted (if using frozen, toss until just warm). 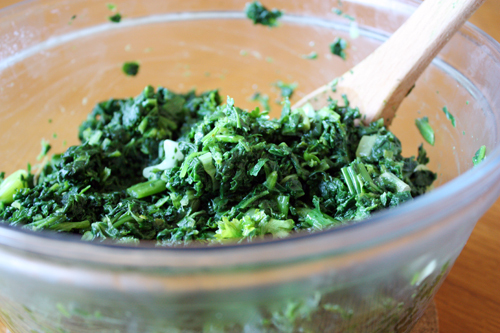 Remove spinach and squeeze out excess liquid through a colander, chop roughly and set aside. 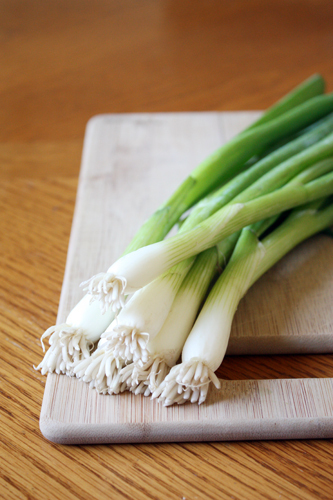 Add remaining 1 tbsp olive oil to pan and add chopped scallions. Saute until soft. Add parsley, spinach, salt and pepper to taste to the pan and cook over low heat about 2 minutes. 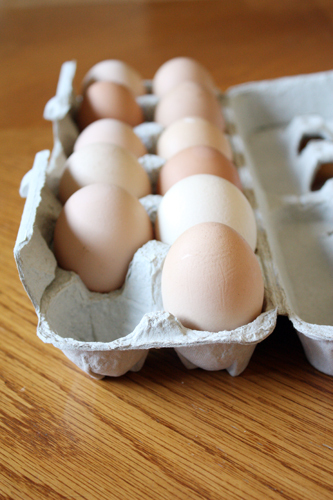 Remove from heat to cool. Stir feta and egg into the cooled mixture. Brush a glass 13-by-9-inch casserole dish with some melted butter. 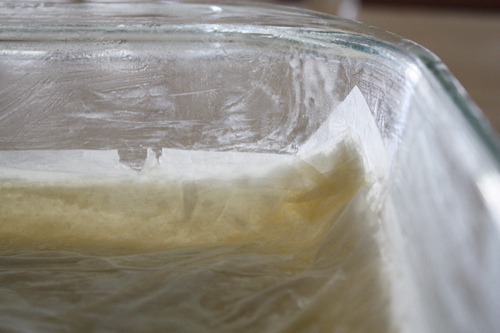 Spread 8 sheets of phyllo dough on the bottom of the dish, brushing each sheet with butter before laying on the next. Top sheets with spinach mixture, then top that with 8 more buttered sheets. Score the top lightly and bake, uncovered, about 40-45 minutes or until golden brown. Remove from oven and let sit 15 minutes before slicing and serving. This looks delicious. They sell this by the triangle at New Pi, and Dexter LOVES it, so I may have to score some wife points and make this for him! I’m glad you’re including more than bread, now, too. I mean, I loved the bread recipes, but I don’t have the time to make it as often as I’d like. Hair down, neon nail colors, and heels are standard for me…so what do I have to do to mix it up?!?! Hehe. That looks delish! 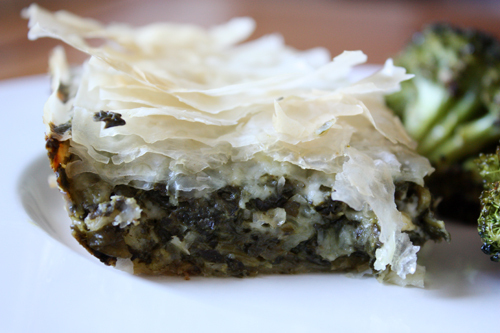 I just had some lack luster spanakopita at a restaurant last night, and yours put the restaurant to shame! It looks stunning…and delicious. I can’t wait to attempt it myself. 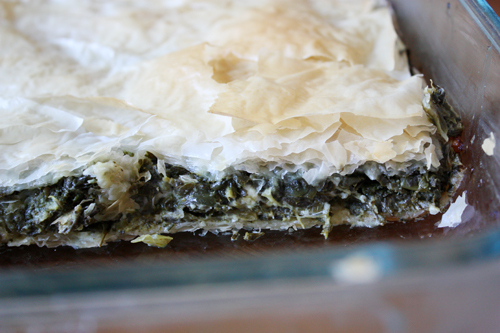 I am completely incapable of pronouncing “spanakopita,” although they are tasty. Yours look great and, dare I say, healthy! Note- I’ve been poking around your blog for a month or so, and I think I’m slowly falling in love with it. This is a good thing as I have come down with the must-bake-homemade-bread bug for the first time. Your documented bread adventures will probably help a ton! I had to say that word out loud four times before I could pronounce it correctly. Spaaaaaank…Spaaaa….nakoooooopita. Spanakopita.